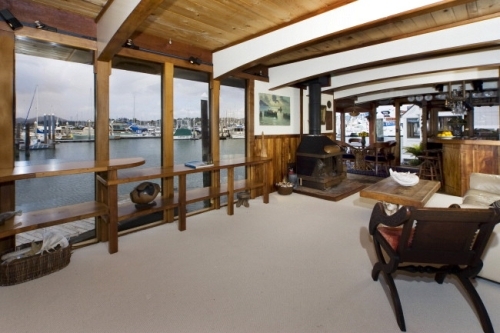 I just helped my client, Pat Kuleto, sell his floating home he calls Lilypad, located at 2350 Marinship Way #3, Sausalito. While I was able to generate unparalleled media and online coverage, it was a challenging property to sell because it required an all cash buyer, who was willing to take on some deferred maintenance and a month-to-month berth lease. Ultimately, it sold for $10,000 above the appraised value for $320,000, making for another happy client in the Marin real estate market. This three-level, 3 bedroom / 2 bathroom home designed by Pat, incorporates his legendary charm, and has views of Angel Island, Sausalito Harbor and hills, Mt. Tamalpais and San Francisco Bay. Property features include Koa wood wainscoting and finishes throughout, floor-to-ceiling bay windows in the dining area, and black walnut bar--all crafted by Bernard Espinet. There's a custom iron spiral staircase and fireplace in the master suite with a beautifully-sculpted ocean motif, designed by Toby Hickman, whose work is throughout Farallon and Boulevard. The master suite also boasts a panoramic view, a custom indoor/outdoor shower with curved glass walls to take in the same great views, as well as a mosaic tile floor, designed by the artist who did the tile work at Boulevard. The master suite also includes a wet bar with mini fridge, and a one-of-a-kind octopus, hanging light fixture designed by Pat and created by George Lucas' Industrial Light & Magic. The cement hull was built by Forbes Kiddo, the master barge-maker, and owner of Forbes Island.